But it looks like there’s something missing in this knitter’s household. One, where are the biscuits? 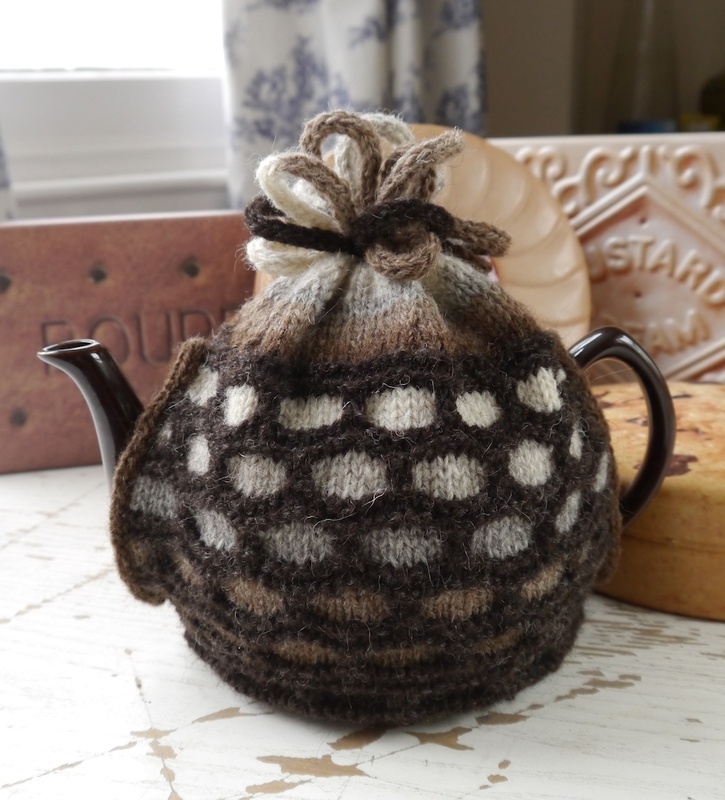 And two, what about a Tea Cosy? The stitch pattern is a classic honeycomb stitch, which, despite appearances, is a very easy slip stitch pattern. In other words, you only knit one colour at a time. However, I did use a genius technique to avoid the jog in the stripes on crown of the cozy. 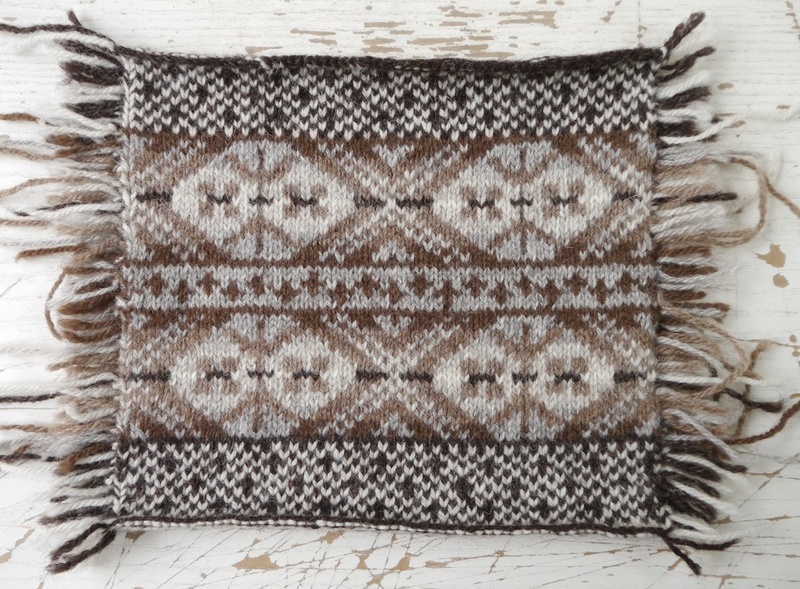 TECHknitter explains all on her blog – I used her so-called travelling jogless stripes variation. Can you see where I changed colour? Invisible change of colour on the crown of the cozy. When I had finished the cosy, it looked a bit bare. In my mind a tea cosy needs a whimsical flourish on top. Enter i-cord. I made a long cord using all available colours, and added it to the crown of the cosy. 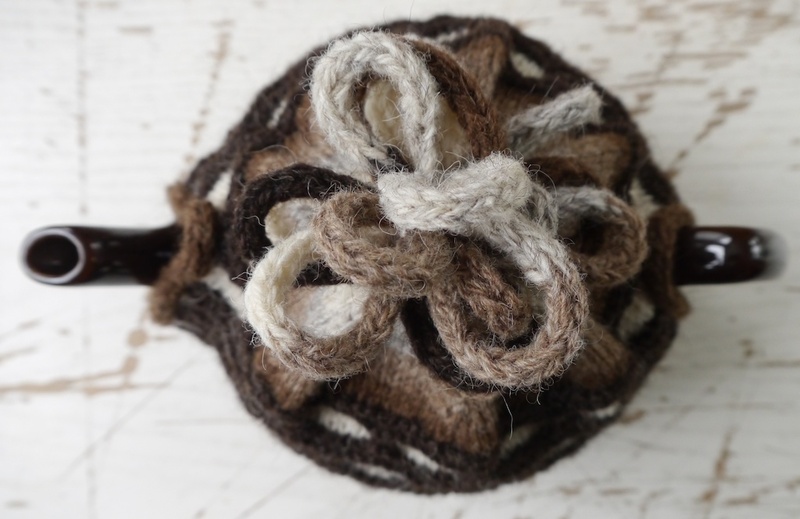 I knitted this tea cosy using left-overs from a number of Fair Isle swatches, using Foula wool. 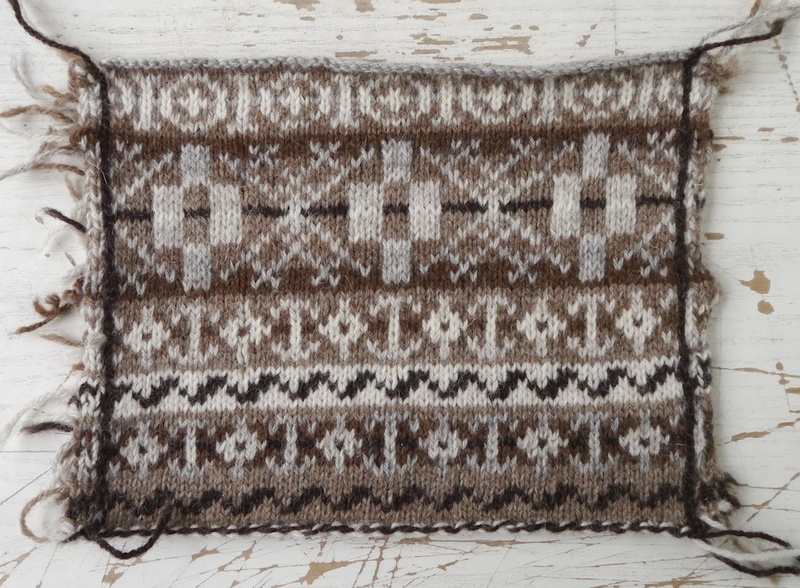 Magnus and Justyna from Foula Wool have asked me to write a knitting pattern for a men’s cardigan, so I’ve been swatching like crazy. Those of you who follow me on Twitter and Instragram will have seen some swatches already. Knitting the swatches and the tea cozy has allowed me to get to know the yarn. It has a great handle and is full of character. And of course, I love the seven natural colours it comes in. As it’s a DK weight, it knits up quickly. 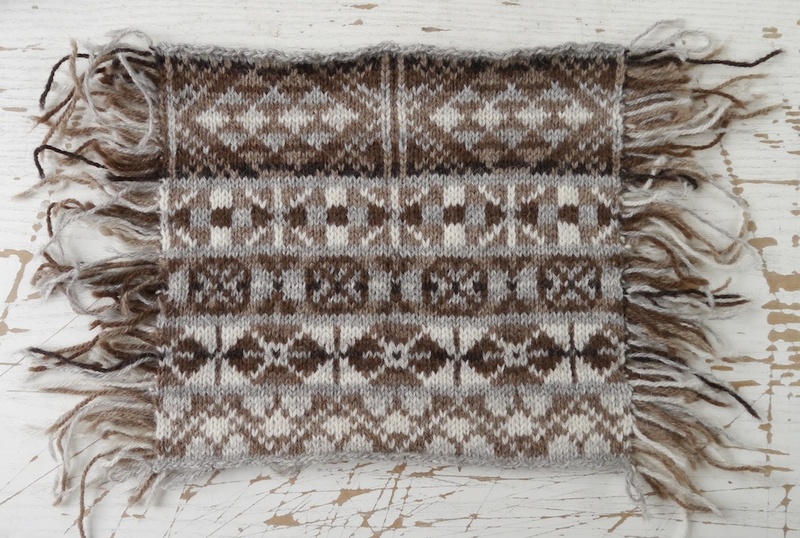 As somebody asked me this on twitter: the swatches are knitted in the round, with additional steek stitches. These are knitted with both colours together. I only casted off the fabric, not the steek stitches, as these were all dropped down all the way. Then I cut all the loose strands and knotted them in pairs using a reef knot. For swatch two I made a calculation error, so I ended up with only three steek stitches, so I used a crochet reinforcement instead. I have now selected the stitch patterns I want to use. If you want to know how the cardigan will turn out, you will have to be patient, as I will reveal the cardigan and knitting pattern during Wovember 2013. But don’t be surprised if I post some teaser pictures in the meantime. The Tea Cosy is Ravelled here. 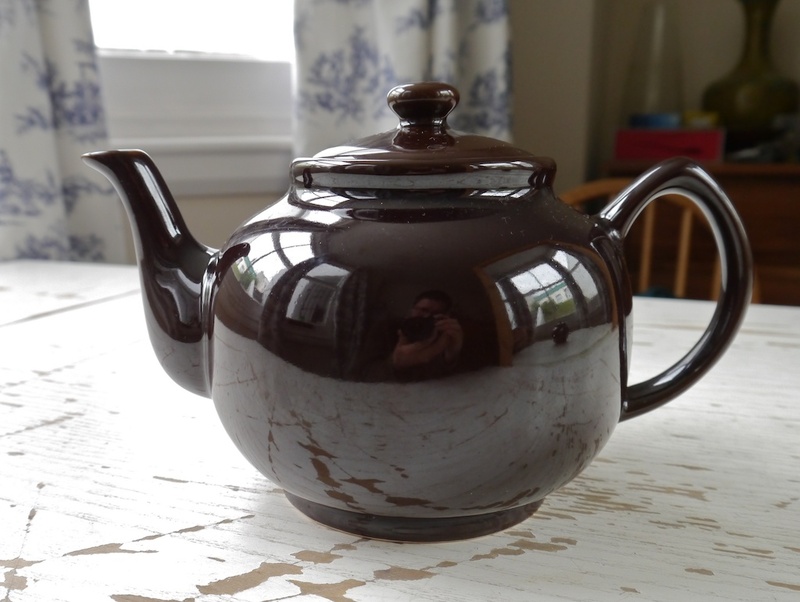 I moved in the other direction with my tea brewing – from loose to bags, and from teapots to canning jars. I found with pots I kept whacking them (very small kitchen) and breaking the handles off and chipping the spout. Also got tired of washing them by hand. Canning jars go in dishwasher, or at least easier to clean by hand. Also have lids, and small footprint for the fridge and lunch bags. Yes, iced tea. Perhaps you never imbibe such. (I know it’s not a universal thing.) I drink quarts of it everyday, not just a spot now and then. Notwithstanding the fact that the tea cosy is a beauty, I REALLY like the snapshot with the giant biscuits because it makes it look like the tea pot belongs to a Borrower. Can it be true? Or is there really a custard cream that large in your house? Oddly enough, I have just come back from Swalmen in The Netherlands with an excellent teapot! I was over there to be part of the Groenewoud Team for the BAck to Back Challenge (which we won – we’re world champs this year and only a little short from the world record) and was practically the only person drinking tea. Our hosts had a spare metal, self-insulated teapot which was given to me, and it’s excellent. 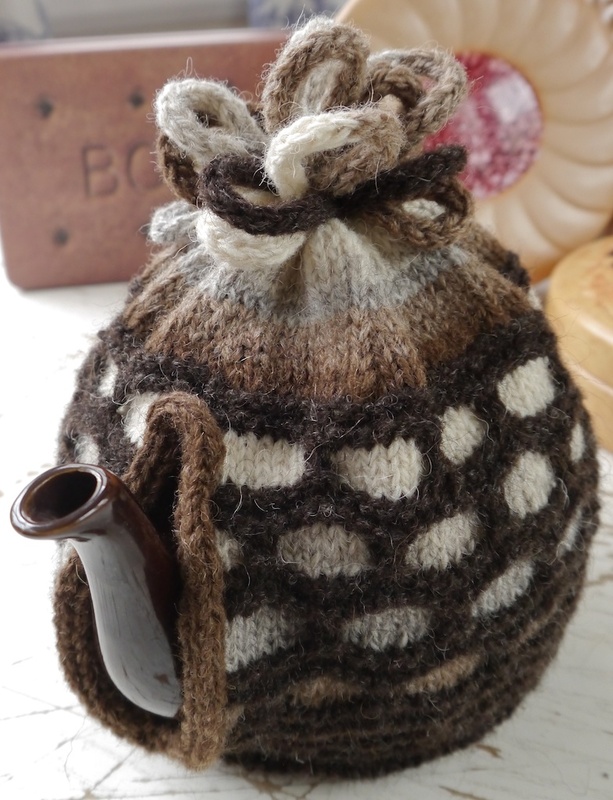 Your teacosy, however, is quite adorable. And I coveting the swatches and yarn.